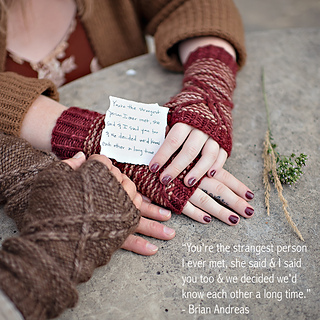 There are precious few times in our lives when we are gifted the everyday miracle of meeting a kindred spirit. We are two souls traveling parallel paths until time puts us in the same place on the same day and we are forever changed by knowing the other exists in this world. 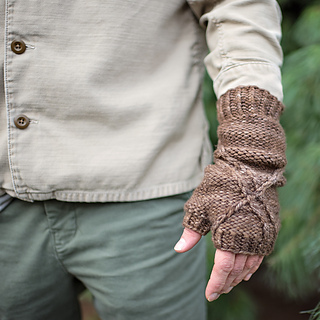 This experience is depicted tangibly in the lines of these mitts with slipped cables against a reverse stockinette backdrop. 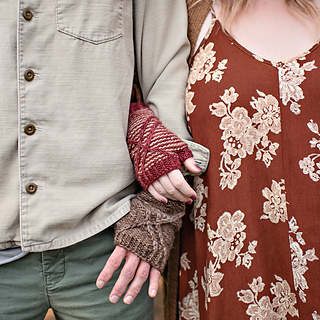 Kindred can be knit in two colors to highlight the lines or in one color for a more subtle effect. 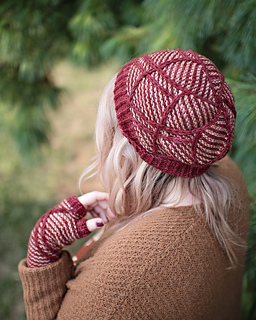 Check out my Kindred Hat pattern for a coordinating set. 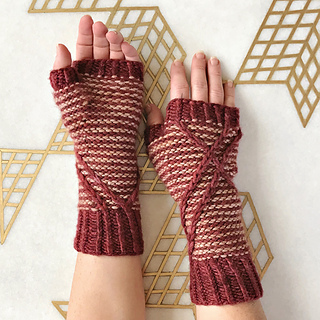 Purchase both the Kindred Hat & Mitts patterns and receive a $2 discount - no code needed and purchases do not have to be made at the same time. The discount will be automatically applied any time the second pattern in the set is purchased. 120 (135) yds / 110 (124) m.
Women’s sample was knit with Malabrigo Twist (100% Baby Merino Wool; 150 yards/100g) in Burgundy (MC) and Applewood (CC). Men’s sample was knit with Malabrigo Chunky (100% Merino Wool; 104 yards/100g) in Dark Earth. NEEDLES: dpns (or size needles appropriate for your preferred method of small circumference circular knitting) in size required to obtain gauge, cable needle. Recommended needle size for aran yarn is US 10 (5.75 mm) and for chunky yarn US 9 (5.25 mm). NOTIONS: stitch markers, darning needle for weaving ends.